I did something interesting here. 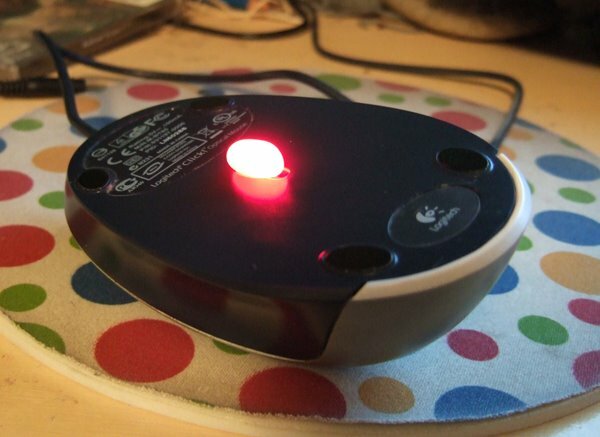 I turned my optical mouse upside down and put a jelly bean on it. It started glowing red. I thought it looked interesting, so here it is. I have to wonder what it is that makes it glow like that. I mean, I know there's some sort of red lazer or something coming out of it, but why does the whole thing look red? 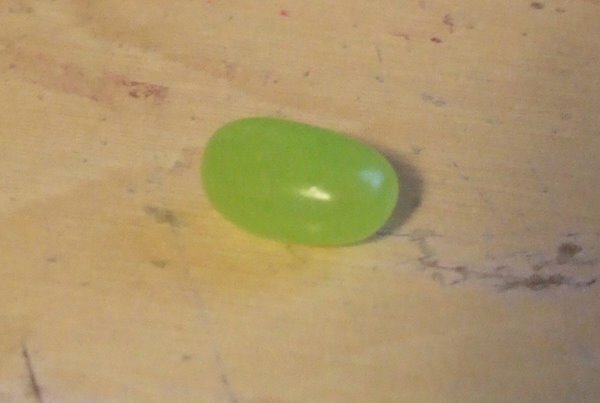 This is what the jelly bean looks like without the mouse's influence. 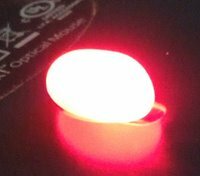 I was considering it for my mutant jelly bean project, considering that it is of below-average size, but I almost threw it out. I've been looking for beans that look interesting on their own, but this doesn't really do much without another jelly bean to compare it to. I actually got six hits on Where's George today, but they were all local. The best that I got was a direct hit at a McDonald's where I spent the bill. I think I may have even seen the guy checking out the bill. Come to think of it, he may have gotten two or three. Two people today got the bills, saw the "track this bill" stamp I use, and thought it was a new feature on the bills. I have to wonder if people know that there's a new series coming out or if it's just people asking a random question. The marks are too haphazard to be a feature on the bill.